I wanted to try a contemporary mola technique for my Fish piece. The two fish images are based on a barracuda shape. The silk coral and other leaves were from my imagination. Since most underwater landscapes tend to be horizontal, as are fish, I found the vertical format to be more dramatic and challenging. “Mola Fish” was created with cotton and silk fabrics, reverse appliqué, hand embroidery, machine quilting, and satin-stitched edges. portray the idea of a fish "sort of" contained in an aquarium. This piece was done with raw-edge applique and used both cotton and silk fabric. Since I am a Pisces, the fish image is almost a part of me. Using my astrological sign was a good place to start. I enjoyed working in some dyed cheesecloth and machine quilting the fantasy plants. 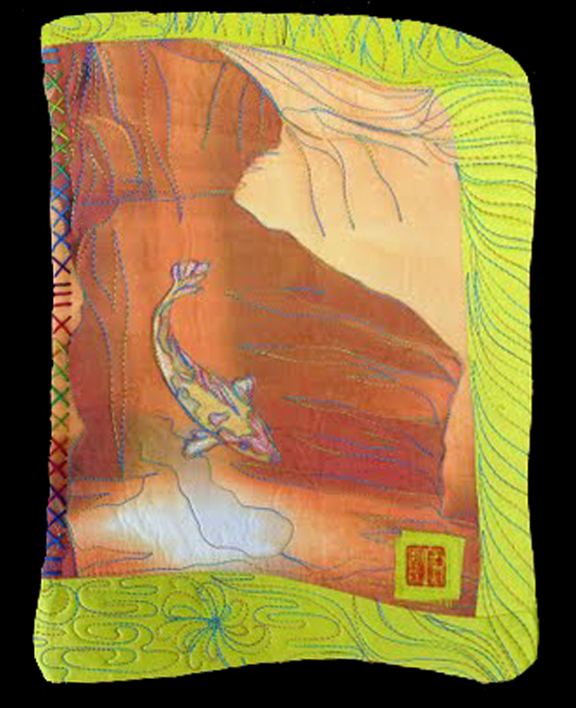 Incorporates a digitally altered photograph of the Grand Canyon, cotton, silk, Dye-Na-Flow paints, machine quilting, and hand embroidery. The irregularly-shaped piece is faced rather than traditionally bound. “Speaking in Color” was juried in and has been awarded a Juror’s Choice prize. Opening Night is this Thursday at 6:30. We would love to see you there. When FiberVoices was created two years ago, we decided to create a joint project to challenge each of our abilities working in fiber and launch our new group. We selected a copy-right free photo and divided it into 6 segments, each member working on a different segment. The idea was to see if we could work to group- established guidelines, and cement individual construction methods and techniques into a cohesive whole. Working with a combination of raw-edge, hand and machine appliqué, we also incorporated piecing, weaving, painting and dye work into the mix. We feel we fulfilled our goals for this project, and we are already at work on a larger challenge aiming for completion in 2011. Each square section is 24” x 24”. Each quilt was mounted and wrapped on gallery-stretched canvas.